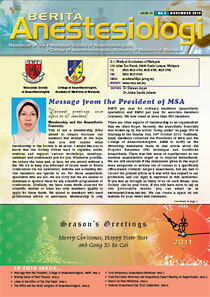 Warmest greetings once again to all members! This is not a membership drive aimed to simply increase our numbers but written in the hope that you will realise what membership to the Society is all about. I would like you to know that the Society strives hard to organise, assist, endorse and support various workshops, meetings, seminars and conferences just for you. Whenever possible, we reduce the rates and, at best, let you attend without a fee. We try to keep you informed of recent news or future conferences via our newsletter, website and e-mailing list. Our members are special to us. For those anaesthetic specialists who are not, we are sorry but we are unable to nominate or sponsor them for any scientific programmes or conferences. Similarly, we have some funds reserved for scientific studies or trials but only members qualify to apply for these funds. We attend to members who need professional advice or assistance. Membership is only RM75 per year for ordinary members (anaesthetic specialists) and RM50 per year for associate members (trainees). We now stand at more than 650 members. There are other aspects of ‘membership to an organisation’ that we often forget. Recently, the anaesthetic fraternity was woken up by the article ‘Going under’ on page SF8 in Starmag in the Sunday Star, 24th October 2010. Suddenly, many members contacted the Presidents of MSA and the College of Anaesthesiologists, AMM to notify us the disturbing statements made in that article about the Propofol Ketamine (PK) technique and Goldilocks Anaesthesia. There was this sense of togetherness as our member anaesthetists urged us to respond immediately. We are still uncertain if the statements given in the report were misquoted or written out of context to a specifically office-based cosmetic surgery anaesthesia, but we had to correct the printed article as it was with due respect to our profession, and our reply is reprinted in this newsletter. If you feel as strongly as many of us on such issues, your Society can be your voice. If you still have more to say on this provocative matter, you can email us at secretariat@msa.net.my. We can create a space on our website for your views and comments. The fee scheduling of all medical disciplines has been the focus of several (heated) meetings held at the Ministry of Health recently by representatives from medical specialist societies. (This is one other way an organization can serve its members). Each discipline would have to come up with its proposed revised fees and all parties will need to come to an agreement. The MSA Fee Schedule Committee would have to relook at the 13th Fee Schedule, as there were some procedures which were without anaesthetic fees. Other issues that need to be addressed include a minimum anaesthetic charge, ICU fees and the charging of separate anaesthetic fees for two procedures. As usual, your input is welcome and in fact, necessary to guide us. The Clinical Research Centre of the Ministry of Health is in the process of compiling National Healthcare Statistics and the MSA has contributed in a small way by checking the name list of qualified anaesthesiologists. The National Specialist Register has yet to have a complete list as registration is still voluntary at the moment. Therefore, it does help to belong to your anaesthetic organization. With more and more anaesthesiologists graduating and practising away from the main hospitals, it is imperative that you stay in touch with the anaesthetic community, be updated academically and be known to us and to the Ministry. We continue to support and endorse CPD programmes so be on the lookout for details. Recently there was the Ventilation Workshop: Back to Basics in Universiti Kebangsaan Malaysia Medical Centre, Train-the-Trainer Workshop & Anaesthesia Expert Meeting in Penang, Fluid Workshop in Universiti Kebangsaan Malaysia Medical Centre, TIVA Workshop in Penang Hospital, 4th POMR conference in Melaka and in December, Ventilation Workshop. The reports of these meetings are in this issue. If you are willing to conduct a CPD activity for the benefit of our members, we have the allocated funds to support you. We were happy to note that many hospitals such as Penang, Melaka, Muar, Batu Pahat, Segamat, Johor Bahru and Klang, took part in this year’s National Anaesthesia Day celebrations, with the theme ‘Unveiling the Mask’. It is interesting to see the various programmes conducted to promote public awareness of our profession, as can be seen in the reports written. Do take this opportunity and plan ahead for your next year’s Department or hospital’s activity. Let’s create “anaesthesia awareness” for the society at large (but not for the patient on your table!). 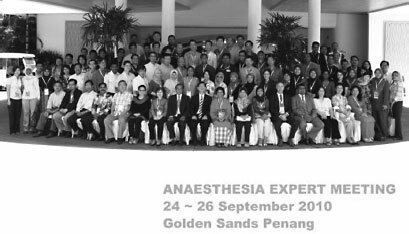 The Asean Journal of Anaesthesiologists is now available on-line at www.aja-online.com so do browse and contribute your articles and papers. The editorship which is now held by Singapore will be rotated within the Asean Societies of Anaesthesiologists and Philippines will soon take over. The ACA and the Asian Australasian Congress of Anaesthesiologists (AACA) are both held every two years in this region, so they are each held every alternate year for our benefit. The next big regional meeting is the 17th ACA in Manila next February. You can explore their website via ours at www.msa.net.my and plan ahead. The MSA will allocate some funds for those presenting papers at this congress and the criteria for such financial support are on our website. Places may be limited depending on the number of applicants, so submit your applications early. We have chosen the theme ‘Borderless Anaesthesia - A New Dawn’ for our upcoming ASM/AGM to be held on 21st to 24th April 2011 at the Shangri-la Hotel, Kuala Lumpur. The organizing and scientific committees are gearing up and preparations are well underway. So do mark your diaries for another up-to-date scientific meeting, an exciting social gathering and of course, our AGM! Several years ago, a very senior member of the MSA was stunned in disbelief when I brought forward the notion that the Society needs to have something to offer to entice members. I still believe that we cannot expect our membership to grow if there is nothing in it for them. I hope I have given an overview of what the Society can offer. In addition to that, the MSA Exco and many supportive colleagues have tirelessly volunteered their services and time despite busy schedules for you. Give us your support in every way you can – be our member, join our activities and volunteer in return. That is the way to sustain our Society! Time flies! It is almost the end of another year. The College Council has met four times already and below is an update on our activities as well as our plans. Prof Victor Lim also noted that the Medical Act is ready to be tabled in Parliament, and once it is amended, the Malaysian Medical Council will be in a position to ensure that those admitted to the Register are competent and fit to practice. The length of supervised working experience required before one could be registered in the NSR: While most specialties only required a period of six months after obtaining the relevant postgraduate qualification, O&G required a period of two years in accredited centers. It was agreed that this should be standardized for all specialties. Referee reports: This was amended to state that the referee should be someone who has had the opportunity to oversee (not observe) the applicant professionally during the period of training or after the postgraduate qualification. Registration: Whether applicants should be required to register in the base specialty first before they are considered for registration in the subspecialty area is to be discussed by each College before a final decision is made. Re-certification: Each Specialty Subcommittee has to establish its criteria for re-certification, which will include evidence of practice, Continuous Professional Development (CPD) activities, research and other requirements. Subspeciality Training Programmes: The Colleges would also be involved in the management of the training programme and exit certification in the subspecialty areas. A Training Committee comprising representatives of the Academy, the Ministr y of Health and the Universities would be formed in the future and would look into conducting exams for subspecialty certification. The number of specialists registered in Anaesthesiology and Critical Care remains about the same. Again, I would like to urge all specialists to register with the National Specialist Register. Another reminder – the fee that you pay (RM1000 for government doctors, RM1500 for private doctors) is for a period of five years which will only commence once the amendments to the Medical Act are passed. Two new guidelines are currently being worked on; the first, “Safety Standards in Anaesthesia” will be on monitoring standards and incorporate infection control in the operating theatre, and is being done by Dr Kavita Bhojwani and Dr Mohd Rohisham. Those interested in contributing to this should contact Dr Kavita or Dr Rohisham, through the Academy of Medicine’s email <acadmed@po.jaring.my>. The second document is entitled “Guidelines on sedation by nonanaesthesiologists” and is being done by Dr Lilian Oh and myself. At the meeting with representatives from the College of Radiology, College of Surgeons, College of Physicians, Malaysian Society of Gastroenterology and Hepatology, College of Dental Specialists and Emergency Medicine physicians recently, everyone was very suppor tive and agreed that there was a need for these guidelines. Once we have the second draft ready we will post it on the College website for feedback from members – so please look out for this and give us your feedback. The AGM of the Academy of Medicine was held on 8th August 2010, at the new Academies Building. Before the AGM, a “Strategic Planning” exercise was carried out, looking into three main areas – Vision and Mission, Organisation and Finance, and Functions and Activities of the AMM. On the same day, the conferment ceremony for fellows and induction of new members of the various Colleges of the AMM was carried out. Among others, Datuk Dr S Radha Krishnan was conferred the Fellowship of the College of Anaesthesiologists. The Day Care SIG had a joint scientific meeting with the College of Surgeons early in the year, just before the ASM, and the Pain SIG held a workshop “Matrix”, on the management of chronic pain. The Obstetrics SIG is planning to hold a one-day seminar on 4th December in HUKM, so please mark your diaries. The SIG on “Wellbeing of Anaesthesiologists” will be organizing a pre-congress workshop as well as a symposium at the 2011 AGM/ASM. Members of the College Council had the opportunity to attend a one-day course on “Effective Supervision” run by Ms Mary Lawson from the Australian and New Zealand College of Anaesthetists (ANZCA). Those who attended were so enthused by their learning experience that we decided to run an “echo” workshop for our own members (and nonmembers). 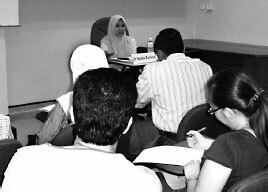 This was successfully carried out in Johor Bharu on 4th October 2010, organized by Dr Tan Cheng Cheng, with Dr CC Tan, Dr Mohd Rohisham and Prof YK Chan being the facilitators for the workshop. Although the number of participants were small, everyone enjoyed the workshop and benefitted from it, and we hope to be able to conduct similar workshops again in the future. This first-ever tripar tite congress, (AMM, Academy of Medicine Singapore (AMS) and Hong Kong Academy of Medicine (HKAM)) will be held on 12th to 14th November 2010 in Hong Kong. Our College will be represented by me (as college president) and Dr Kavita Bhojwani. We will report more on this in the next bulletin. The College, together with the MSA, is participating in the discussions with the Ministry of Health for revision of the Fee Schedule (Schedule 13) under the Private Healthcare Facilities and Services Act (1998) and Regulations (2006). Our representatives are Dr Raveenthiren and Dr Alan Wong. Further to my comments on this topic made in the previous issue of the Berita Anestesiologi, I have been informed that the issue of whether the anaesthetic consent can be obtained by a different person from the one administering the anaesthetic, as in the case of patients being assessed at the anaesthetic clinic before the procedure; in these cases, the person seeing the patient at the anaesthetic clinic takes the consent and he/she is not likely to be the person who is going to administer the anaesthetic: I was informed that the answer to this question is Yes, i.e. anaesthetic consent can be obtained by a different person from the one administering the anaesthetic. However, if consent was taken beforehand by another person, it is the responsibility of the anaesthesiologist on the day of surgery to reaffirm with the patient that he/she understood the explanation and signed willingly. As usual, I cannot end my message without another plea for all of you reading this Berita to please join the College of Anaesthesiologists as well. You can go to the Academy of Medicine website to download the form. Please let me welcome more members to the College! Happy Holidays to those who are managing to get time off at the end of the year, and festive greetings to all (Selamat Hari Raya to our Muslim friends, Happy Deepavali to our Hindu friends and Merry Christmas to our Christian friends). 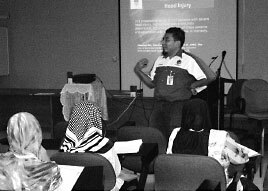 The constant need to update ourselves on recent advances in fluid therapy prompted the 2nd regional workshop on ‘Making Sense of Fluid Therapy - A Guide to Perioperative & Intensive Care Management’ in Sarawak General Hospital. 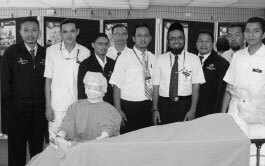 This workshop was co-organized by the Department of Anaesthesiology and Intensive Care, Sarawak General Hospital with the Malaysian Society of Anaesthesiologists, and was supported by the Aesculap Academy Malaysia. 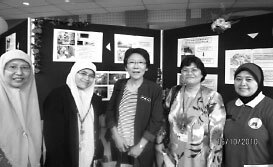 It was part of the Malaysian Society of Anaesthesiologists Continuous Professional Development Activities. 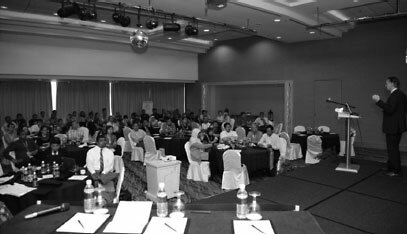 The workshop attracted a total of 90 participants comprising doctors and allied healthcare personnel from all over Sarawak. Topics covered included the pathophysiology of fluid therapy, the role and comparisons of different types of intravenous fluid, fluid therapy before, during and after surgery as well as intensive care fluid management. Apart from our very own local speakers, the distinguished speakers were Dr Laila Kamaliah from Hospital Selayang and Prof Dr Donat R Spahn from Zurich, Switzerland. The Q and A session towards the end of the workshop led to many doubts resolved and learning points emphasized. The evening ended with a note of appreciation and thanks to the speakers. The workshop was indeed a success. We would like to thank everybody involved especially B.Braun and Aesculap Academy Malaysia for their commitment and support. We refer to the article 'Going under' on page SF8 in STARMAG in the Sunday Star, 24th October 2010. The statement "Dr Friedberg's patients typically awaken within minutes after the operation, while the common method might take hours, if not days" is not just misleading; it is absolutely wrong. General anaesthesia has been developed to become a very precise science and all anaesthetics are tailored to provide unconsciousness only for the required period of time, i.e. for the duration of the surgery and the procedure. The patient is woken up immediately after the surgery or the procedure is over, and this only takes minutes (not hours or days as stated). This is the normal, everyday practice of anaesthesia. There is no technique used today which takes "hours if not days" for the patient to wake up. As such the extrapolation to complications such as ‘deep vein thrombosis’ due to prolonged immobilization directly associated with anaesthesia is baseless. Occasionally, patients are deliberately kept unconscious or sedated for longer periods such as in the intensive care units for the patient’s surgical or medical reasons. There are many techniques of anaesthesia and many types of anaesthetic agents available today. The technique chosen by the anaesthesiologist depends on several factors, including the type of surgery and the patient's condition. There is no "best" anaesthetic technique as every technique has its strengths and risks. To say that Dr Friedberg's method is superior to other methods and to imply that it is the only safe method is highly inaccurate. The most important factor for safety in anaesthesia is a skilled, vigilant anaesthesiologist, and not the specific technique or anaesthetic agent used. Using ketamine and propofol also involves risk and your article is irresponsible in implying that this risk is less than that of other techniques. The side effects of anaesthetic agents are well known to anaesthesiologists and we take pains to minimise them in our patients. While it is true that we usually use a number of drugs in each anaesthetic (this is the concept of "balanced anaesthesia", where different drugs are used to achieve the triad of unconsciousness, muscle relaxation and analgesia or pain relief) it is clearly an exaggeration to say that a "typical" anaesthetic uses "eight to 15 drugs". Finally, as responsible and modern doctors practising evidence-based medicine, anaesthesiologists are always ready to learn about new techniques and new drugs and incorporate them into our routine practice. However, this is usually done in the context of peer-education - articles are published in scientific journals describing new drugs and techniques and experts speak at scientific conferences to share their knowledge and experience. We would like to point out to you that the seminar advertised by your article in The Star is a commercial venture that has not received any suppor t or endorsement from our anaesthetic professional bodies. The World Federation of Societies of Anaesthesiologists (WFSA) was founded in 1955 in The Netherlands. When it was initiated, there were 28 founding Member National Societies and today this has extended to over 120. There have been a series of World Congresses of Anaesthesiologists (WCA) held in the name of WFSA since then and these are listed in Table 1. In recent years, other groups have held ‘alternative’ World Congresses, often focusing on specific sub-specialties, but there is only one WFSA sponsored WCA. This happens every four years in a different area of the world. Each WCA is organized by a national member society which imparts its own local flavour to the proceedings but there are a specific set of targets that need to be achieved by each Congress. Many people have discussed what defines a ‘good Congress’. Such debate is outside the scope of this article and there can be no doubt that the perception of a Congress depends very much on one’s own circumstances. There are four main components of a WCA; firstly the delegates who spend their money to attend; secondly the trade exhibitors who invest large sums of money to support the meeting; thirdly the WFSA which has a series of constitutional obligations to meet and fourthly the local Conference Organizing Committee (COC). All of this activity is facilitated by the Professional Congress Organizer (PCO) who in this case is ChoiceLive from the United Kingdom (they also ran the Cape Town Congress of 2008). I believe there are many different types of delegates but the majority attends the WCA to learn new aspects of their professional activity; this may be in terms of activities that take place in their own geographical region which are often highlighted by presentations from the WFSA Regional Sections. Others will be looking for new initiatives which may appear in programmes facilitated by specialist groups, like obstetrics or paediatrics, while others will be searching for answers relating to their professional development and organizational requirements. Many young (and old!) delegates will be presenting their own research or a distillation of their experience either at oral sessions but more commonly at poster sessions. Others will be looking to attend the plethora of workshops which are presented at the WCA. One of the most important aspects of any WCA is the ability of delegates to meet others from different backgrounds and environments. The exchange of ideas and experiences that takes place within scientific sessions, but also over breakfasts, lunches and evening social gatherings, often leads to lasting friendships and facilitation of professional improvements in less affluent areas of the world. The trade exhibition is a vital aspect of any WCA. It permits the industrial companies operating in our sector to demonstrate their latest innovations and allows them to access anaesthesiologists from all over the world. They provide a huge funding boost to the meeting and their attendance, with the associated financial support, should never be taken for granted. Most delegates recognise the benefits of attending the trade exhibition to familiarise themselves with the latest innovations and, increasingly, they are also attending the growing number of ‘scientific presentations’ that occur within the exhibition. The WFSA has to undertake a series of administrative duties within the time frame of the WCA. All of the activities of the WFSA are governed by the General Assemblies (GAs) to which every member society, which has paid its annual membership fees, sends representatives in proportion to their number of announced member anaesthesiologists. These representatives accept the reports of the myriad of permanent and sub-specialty committees of WFSA and determine the future activity of the organization, often at the instigation of the elected Executive Committee and Officers. In addition the GA confirms the appointments of all members of all committees and, for the first time in Buenos Aires, will actively elect those standing for the Executive Committee and Officer posts. All WFSA committees have the opportunity to meet at the WCA and plan their activity for the next four years. The Scientific Program will cover the latest scientific knowledge in different areas of Anesthesiology, Perioperative Medicine, Intensive Care, Emergency Medicine and Pain Management. Topics will include research, organization, economy and education. The preliminary programme will be available shortly. It will be comprehensive and diverse, representing the needs of our colleagues from all around the world. You will surely be able to find the best level of lectures not just at the cutting edge of the science of anaesthesiology, but also the ‘ABC’ of the safe practice of our specialty, for those delegates looking for this information. We hope to have only electronic poster sessions to save delegates having to transport bulky posters. Workshops will have a special priority in this WCA, with simulations and the latest technology designed to improve our access to new skills. Our aim is to improve the skill and knowledge level of all of our colleagues coming to Buenos Aires. Be sure that there will be a lot of science, but there will be also a lot of fun! We are developing a wide variety of social and cultural programmes – there will be tango lessons, parties, and the ever present possibility of tasting our famous cuisine including fantastic barbeques which will be surely enjoyed by you all. I am confident you will feel very comfortable living with our Argentinean culture and it will provide you with a unique opportunity to make new friends in the world of the anaesthesia. There are so many places you will surely feel that this WCA is a unique opportunity to mix science and leisure. It will be an unforgettable experience. I am sure you will all agree he ‘paints’ a very attractive picture. The website www.wca2102.com is the ‘definitive source’ for all information relating to the congress and your attendance. You will be able to register, book workshops, book accommodation (designed to suit all budgets) and select any tourist activities all ‘on line’. The website will have full details of the scientific programme, posters, social programmes, exhibitors, sponsors and much more. Hopefully it will answer any of your questions relating to the congress, but, if you do still need further information or help then just ‘contact us’. The information on the website is being constantly updated and if you want to be sure you don’t miss any important deadlines (such as poster submission dates, closing of early registration) then make sure you register your interest on the website and we will send you timely reminders. A few final comments. The WCA needs to be a financial as well as a scientific success so that the WFSA can continue to run its extensive programme of educational, publication and safety activity all around the world. The membership dues of the member societies do not fund this activity which comes almost entirely from the surpluses generated by the WCA. This in part determines the registration fees charged for the delegates. We hope you will attend the WCA in Buenos Aires. It will be a scientific, social and cultural triumph and, if you are not there, then for years in the future you will hear from those who were that phrase “Ah but you should have been there in 2012 in Buenos Aires; that was a truly great meeting.” Oh and start taking your Tango lessons soon! 25th - 30th March 2012 is the date for the next World Congress of Anaesthesiologists in Buenos Aires, Argentina; start planning NOW. 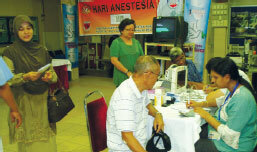 A Total Intravenous Anaesthesia (TIVA) Workshop was held in HospitalPulau Pinang on Saturday, 16th October 2010. This workshop was organized to benefit a wide audience, ranging from those who had not previously administered TIVA to those who had practiced TIVA but who wished to advance their understanding of the underlying theory and technicalities. Many thanks to Prof Dr Lim Thiam Aun for giving us all his lectures on the Basic Principles and Practical Application of TIVA. We could not have picked a better person to enlighten us in such an easily comprehensible and yet comprehensive manner on the principles and techniques of Target-Controlled Infusion. The problems with TIVA / TCI that Prof Lim highlighted further dispelled our ignorance and doubts about introducing it into our practice. The workshop incorporated a hands-on session for the participants. 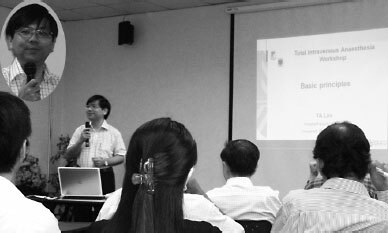 A total of 38 participants from government and private hospitals attended this half-day TIVA workshop. vapours). Prof Lim’s travel was sponsored by Malaysian Society of Anaesthesiologists. Abbott Laboratories provided secretariat services and Fresenius-Kabi provided TCI pumps for the hands-on session. The long awaited rocuronium reversal agent will hit the shores of Malaysia soon! MSD Malaysia, organized a special train-the-trainers and anaesthesia expert meeting on Sugammadex (Bridion) was held from 24th - 26th September 2010 at the Golden Sands Hotel in Penang. It was a short but informative meeting which was attended by 84 delegates by both government and private hospital anaesthetists. For the train-the-trainers workshop, we had Hans de Boer and Shane Varughese leading the sessions. Shane represented MSD and gave background information on the discovery of sugammadex while Dr. Hans (an anaesthetist from Netherlands) who has done plenty of research on Sugammadex spoke at length on its introduction and use in Europe. We were excited that Malaysia will be the first country in East Asia using this drug. The next day, we had our expert meeting on Sugammadex. I gave a brief lecture on “Role of deep neuromuscular blockade” while Prof C Y Wang from UMMC gave a comprehensive lecture on “Residual Neuromuscular Blockade and its complications”. Dr Hans covered much of the subject matter on reversal of neuromuscular block with Sugammadex. We appreciated the knowledge shared at this weekend conference and hopefully will be able to see better patients in the recovery period with use of Sugammadex in the future. Since 1831, when Dr Thomas Latta of Scotland administered the first documented intravenous fluids for the treatment of cholera, the issue of fluid therapy has gained much debate, earning a place in almost every medical symposium or meeting. Fluid therapy has also seen huge advancements in the past 25 years and is a cornerstone in the treatment of every patient. 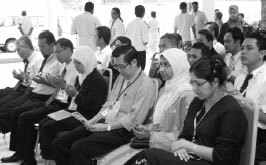 With this in mind, the Fluid Workshop 2010, was organised by the Department of Anaesthesia and Intensive Care, Universiti Kebangsaan Malaysia Medical Centre, Aesculap Academy and the MSA. The one-day workshop, being held in collaboration with the MSA for the first time, was attended by 72 participants from various hospitals all over Peninsular Malaysia. There was a mix of house officers, medical officers, staff nurses and paramedics from various departments. Topics included pathophysiology of fluid imbalance, hemodynamic monitoring and balanced solutions. There were also small group discussions on trauma, dengue and intraoperative blood loss. Participants seemed to have found the small group discussions particularly useful and hoped that this would be included in future meetings. All in all, the workshop was deemed a success and we would like to thank B Braun and Aesculap Academy for their commitment and sponsorship towards continuing medical education. 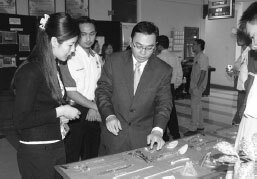 In conjunction with the recent World Anaesthesia Day 2010, a 4-day program was organized by the Department of Anaesthesiology and Intensive Care, HPSF, Muar. The core item on the itinerary was the exhibition. 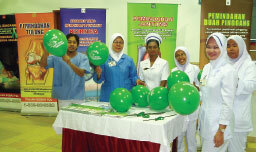 It was held from 12th October 2010 till 15th October 2010 at the foyer opposite the Radiology Department in HPSF. The exhibition was open for public viewing from the hours of 8 am till 5 pm. The objective of the event was to give as much exposur e to the public and the hospital staff regarding the intricate process of anaesthetic ser vices given to patients in HPSF. Posters that gave simple, vivid and educational information to patients regarding the anaesthetic clinic, preoperative ward admissions, anaesthetic consent and the preoperative, operative and postoperative management of patients. We also took the initiative to include brief but descriptive posters on the common surgical procedures done in our operating theatre. A mini simulation of the operating theatre and the relevant core anaesthetic monitoring equipment. A replica of a typical Intensive Care Unit bed fully equipped with its mechanical ventilators and monitoring equipment. An Acute Pain Service corner. A Q&A corner (enabled the public to talk to real life Anaesthesiology Medical Officers). 'UNVEILING THE MASK' competition (the public were asked to identify and match staff with and without mask; and short quizzes based on the exhibition. Winners were rewarded with small souvenirs). Basic Life Support demonstrations (conducted by certified personnel). A career guide video show on anaesthesia and intensive care related careers. The kick-off of the week long celebration was the colouring competition. The participants were preschoolers from three preschools namely Tadika KemasHospital Muar, Tadika Sabak Awor and Tadika PASTI Taman Sri Temen ggung. It was held from 9 am till 11 am. The panel of judges were Dr Zezy Lina Osman, Anaesthesiologist; Hj Bahrin, Hospital super visor and Sr Mah Majit from the Unit Pergigian Klinik Komuniti. The children were also entertained by a 'fairy' and a 'cat' during the event. The stencils for the competition were from our own paediatric an aesthesia department. After the competition, was the opening ceremony. It was of ficiated by HP S F Director, Dr Ahmad Pauzi Abu. During this auspicious event, the inaugural logo for the Department of Anaesthesia and Intensive Care, HP S F was launched. A prize giving ceremony for the colouring competition jubilantly ensued. Apart from the ongoing exhibition, we were graced by a visit from 80 Form 3 students from Maktab Rendah Sains Muar Bakri. 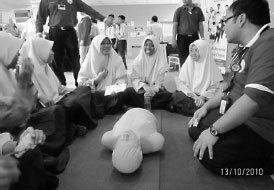 They were shown the career video and they participated in a Basic Life Support showcase. Another entourage of 80 Form 5 students from Sekolah Menengah Sains Tanjung Agas was enter tained from 9 am till 2 pm. They were accompanied by two teachers. We were also delighted to have a group of 47 Standard Six students from Sekolah Rendah Agama Bersepadu Muar from 11 am onwards. The culmination of the program was the Pain as the 5th Vital Sign Seminar. The jubilant event was graced by our State Pengarah, our National Advisor for Anaesthetic and Intensive Care service, MOH, specialists, medical of ficers, nurses managers, medical assistants and registered nurses from hospitals from all over Johor. 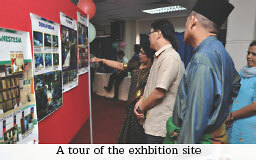 Guests and participants also took the opportunity to visit the exhibition site. Through the course of the week, we received 965 registered visitors from various categories and the ‘unveiling the mask’ event was indeed a great success. 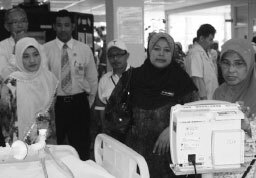 Kudos to all the staff of Department of Anaesthesia and Intensive Care, HPSF Muar for a job well done! 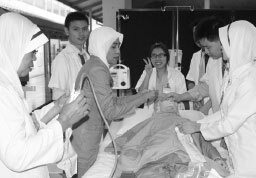 World Anaesthesia Day was celebrated in Penang Hospital on 15th October 2010, a day before the internationally designated date, 16th October 2010. Many people do not realise the importance of having an anaesthetist with them during surgery and the efforts of the person behind the mask frequently goes unrecognised and unheeded. 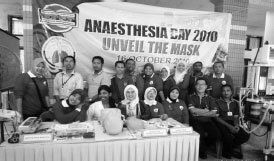 We hoped to increase awareness regarding the importance of anaesthesia, preoperative preparation and anaesthetic techniques by “unveiling the mask” hence the theme for this year’s World Anaesthesia Day 2010. Our committee included staff from all divisions of the Depar tment of Anaesthesia i.e. doctors, nurses, medical assistants and support staff who worked hard to prepare for this event. 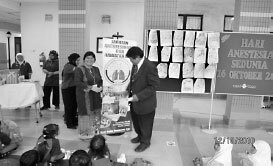 We also received additional, much welcomed help, from Penang Hospitals Education Resource Centre. The day started off with an opening ceremony at the foyer of our hospital. 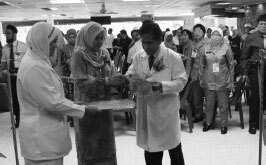 It was attended by Dr Raja Lope Ahmad Raja Ariffin, Penang Hospital Director, Dato’ Dr Jahizah Hj Hassan, Head of the Depar tment of Anaesthesia and Intensive Care as well as the various heads of other departments, doctors, nurses, allied health staff and members of the public. The welcoming speech was given by Dato’ Jahizah followed by an opening speech by the hospital director who then officially launched the World Anaesthesia Day 2010 celebration. A short video detailing the daily activities in the operating theatre, complete with drama and an intriguing music score was also shown. Subsequently, after the cutting of the ribbon to signify the launching of the event, everyone was invited to visit the display area. Among the activities organised were the viewing of posters and the mock Operating Theatre set-up, as well as a simple medical check-up that included blood pressure monitoring. Our posters gave an introduction to anaesthesia, the types of anaesthesia i.e. 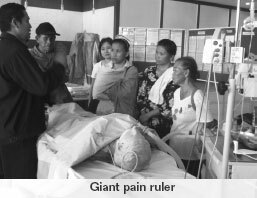 general anaesthesia and regional anaesthesia as well as brief descriptions of intensive care and chronic pain services. Brochures in both English and Bahasa Malaysia detailing the purpose of premedication rounds, clinical assessment before surgery and explaining the risks of anaesthesia were available. In it we also addressed the issue of awareness during anaesthesia. We were proud to celebrate this day as it also comes in conjunction with the first anniversary of our new ICU and our recently started Pain Clinic. Overall, the event was one of much fun, giving us an opportunity to interact with the public as well as acknowledge the fact that we have come a long way from 1846 when the first public demonstration of anaesthesia was given. The practice of Anaesthesia is one of the most beneficial discoveries in medicine and it continues to advance with time, always ensuring that the highest regard is kept for patient safety, comfort and care. Our hospital celebrated National Anaesthesia Day a bit late on the 25th of October 2010. This was the first time our depar tment celebrated the day. The venue of our event was in Klinik Pakar 4 where the public could gain access to our exhibition freely. Our opening ceremony was graced by our Deputy Hospital Director. We had posters featuring different services in our operating theatre, intensive care unit, acute pain ser vice and pre anaesthetic clinic. A multimedia presentation was also available to the public to elaborate on the services that were available. We set up booths for the public and the hospital staff where they took part in quizzes which won them prizes donated from generous sponsors. We also displayed our full ICU set up including the ventilator and syringe pumps, airway adjuncts, equipment for regional anaesthesia and the Patient Control Analgesia machines. We had an overwhelming response from the public and even from our staff. Nearly 500 visitors attended our exhibition. Here they were exposed to what anaesthesia and intensive care services really are. Some of the public were even quite surprised to know that our department actually existed in the hospital! All of us doctors, nurses, assistant medical officers and even our medical attendants who had worked really hard for nearly three months, felt all our hard work had paid off. We felt that we had achieved our objectives of providing information to the public with regards to our services. Since the response was every encouraging, we plan to stage the event on bigger scale next year. Kudos again to all the members who made our National Anaesthesia Day a resounding success! 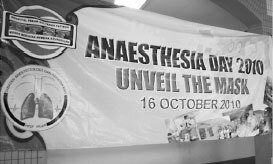 Anaesthesia Week was celebrated at Queen Elizabeth Hospital 2, the newly bought premises (formerly Sabah Medical Centre), for a few days from 18th October, 2010. Several activities went on concurrently for one day. Members of the anaesthetic and OT team chipped in to make it an event to remember. were not necessarily innocuous and harmless. They should tell their doctors if they were taking them, and to stop these “natural products” two - three weeks before surgery. Interactions with anaesthetics and other complications such as bleeding could jeopardize their lives. Other messages driven home were that all risks associated with herbals at this time were not known fully, and taking Viagra before anaesthesia was dangerous for men. 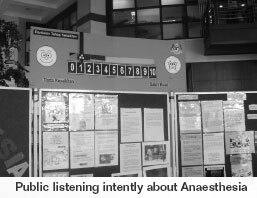 Another set of posters highlighted the history and regular work of anaesthesiologists in surgery, intensive care, pain service and trauma. Anaesthesiologists also play a very important part in novel areas such as pandemics, mass disasters, germ & chemical war fare and organ donation. The simulated scenario of a patient undergoing anaesthesia and surgery, with various vital signs on full display, an endotracheal tube in situ, chest rising and falling with ventilation, was also met with great interest. To simple kampong folks, going under anaesthesia for an operation, was something highly mysterious. 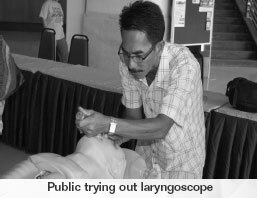 A number of adventurous folk even tried their hand at laryngoscopy, and had a glimpse in par t, of the work of anaesthetists. Yet others learned to per form chest compressions on Resusci- Anne, an impor tant par t of cardiac resuscitation. A huge light blue pain scale ruler was displayed for public awareness of “Pain, the Fifth Vital Sign” initiative and the Acute Pain Service that we provide. PCA pumps and other pain equipment such as nerve block needles were on display, together with some anaesthetic drugs and infection control paraphernalia. 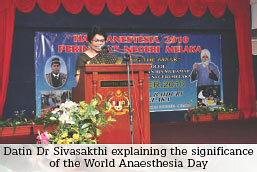 World Anaesthesia Day is celebrated annually on 16th September as a remembrance of Modern Day Anaesthesia. 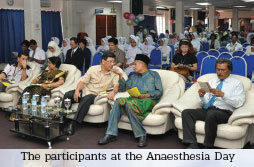 This year Anaesthesia and Intensive Care Depar tment Hospital Melaka celebrated it on 22nd October 2010 in Auditorium Hospital Melaka. The celebration started with a radio interview on the importance of Cardio Pulmonary Resuscitation (CPR) to the public as a part of “Unveiling the Mask” theme this year. It was followed by a CPR training session attended by 40 par ticipants from various institutions namely students from the Department of Civil Defense and the Fire and Rescue Department. Concurrently, a poster presentation of all the activities of Anaesthesia and Intensive Care Depar tment were displayed for a week at the hospital main lobby for the public to have a better understanding of the role of an anaesthesiologist in managing patients’ in accordance with the theme “Unveiling the Mask”. 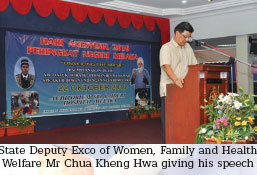 This joyous occasion was officiated by the honorable State Deputy Exco of Women, Family and Health Welfare Mr Chua Kheng Hwa in the presence of the State Health Directors on the evening of 22nd October 2010. 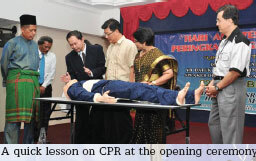 The successful insertion of a laryngeal mask followed by CPR on a mannequin by Mr Chua Kheng Hwa inaugurated the opening ceremony. A multimedia presentation on the department activities followed by a short presentation on the impor tance of Cardio Pulmonar y Resuscitation enlightened the audience on the activities of our department. A quiz was held just prior to the closure of the celebration which received an overwhelming response from the audience. In summary, the day was indeed an eye opener for not only the public but also for the staff of hospital Melaka on the various roles of the anaesthesiologist in tandem with the theme for this year, “Unveiling the Mask”. In conjunction with Anaesthesia Day, which is celebrated yearly on the 16th of October, our depar tment had some activities planned for the public. The event took place in the foyer on the ground floor of the main building. We set up booths with posters and displayed equipment to educate the public on what anaesthesia is all about and the role of anaesthesiologists in our countr y’s healthcare system. Quite a number of people visited the booths, and two medical officers and medical assistants were available to answer queries. In addition to all of this, we played a video on anaesthesia being administered to a patient. There also was, in the same area, a booth set up in conjunction with organ donation week. We helped in creating awareness on organ donation by answering many questions the public had. As participants in the event, my colleagues and I were in charge of medical check up by taking blood pressure and random blood sugar for members of the public. We referred some members of the public to the outpatient depar tment when abnormalities were detected. There was good response to this entire event. Over these two days, we had close to two hundred people who visited our booths. Brochures and pamphlets were distributed for further information. In summary, the event was a success and we hope the public is more aware of our important role in the healthcare system.